The driving position for an F1 car is fairly detached from that of it's road car counterpart, however it shares the same guiding principles: Comfort and Ergonomics. 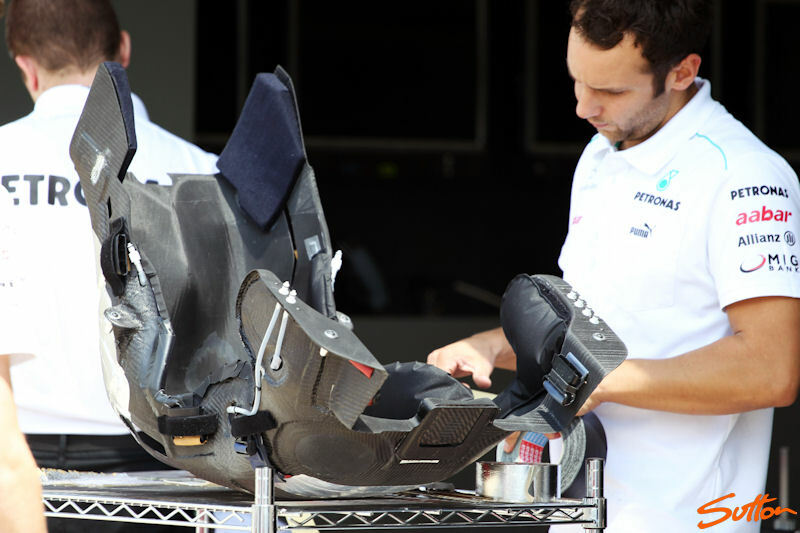 Unlike with your road car, a race driver will undergo a seat fitting. 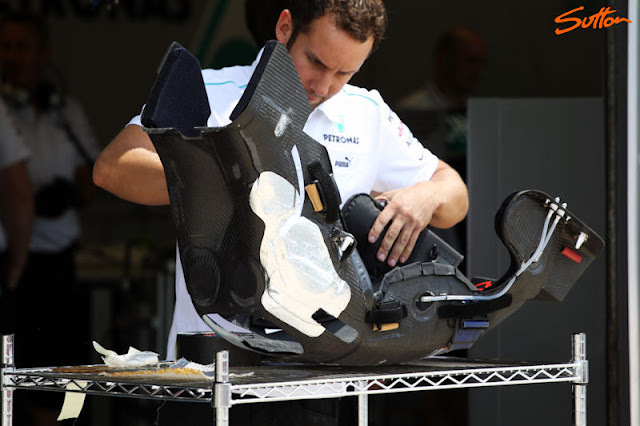 Formula One seats are essentially a cast of the driver enabling them to assimilate with the chassis. When a driver goes for a seat fitting at the factory he will be greeted with a bag laden cockpit, once the driver has climbed inside the bag will be filled with foam, as it expands it will meet with the contours of both the chassis and the driver leaving an imprint for the team to work with. From here the seat is scanned for manipulation in CAD making it easier for the designers to make alterations to suit both the chassis layout and the driver. The 3D CAD model also enables the mandatory safety devices to be added which allow the driver to be extracted from the car if they are injured during a crash. It is essential that the seat be both comfortable and form fitting as a driver will spend upto 2 hours racing the car around at a GP whilst being subjected to incredible amounts of G-Force both through lateral cornering forces and braking/acceleration forces. I often use the video below as a reference for poorly fitted seats as Lucas Di Grassi takes an unsuspecting victim around the Abu Dhabi circuit. Unfortunately for this poor chap someone has failed to tighten his harnesses enough but what it does show is the forces inflicted throughout a lap. Armed with this information you can now see how imperative it is the driver is secured correctly not only for his own well being whilst being subjected to the forces. But in order to FEEL what the car is telling him. The body acts like a pendulum inside the car with the bum recording the information the car is giving it, this is transmitted and reacted through the spine giving a tactile experience to the driver that would be lost if they were sliding around in the seat. 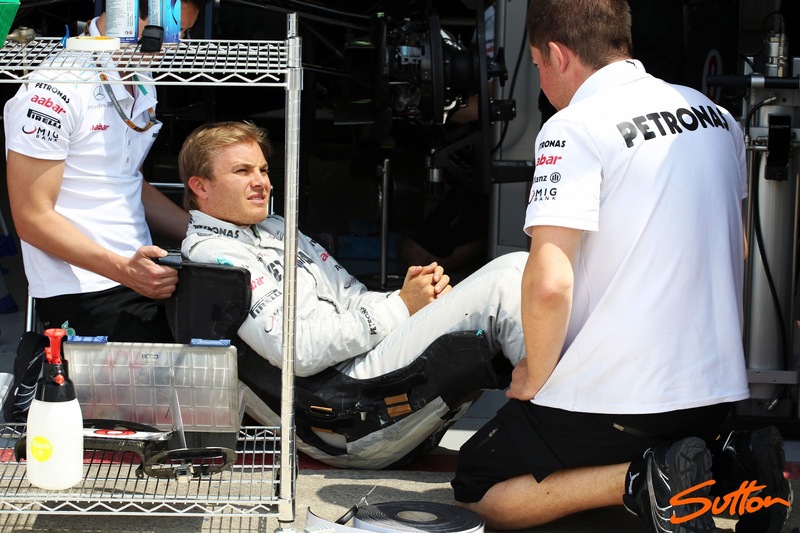 As we can see in the images below of Nico Rosberg's seat out of his then W03 the slender component is fitted with padding around the shoulders and knees to aid him as the cars forces act upon his body.